Virgin has been leasing 4 ex-Air Berlin A330-200s since March 2018 to help out with the issues caused by the B787 engine problems. These lease aircraft had Air Berlin’s original Thomson seats which there are variants of on many airlines business class products such as Aer Lingus. The aircraft operate on the Manchester routes to New York, Boston, San Francisco and Barbados. 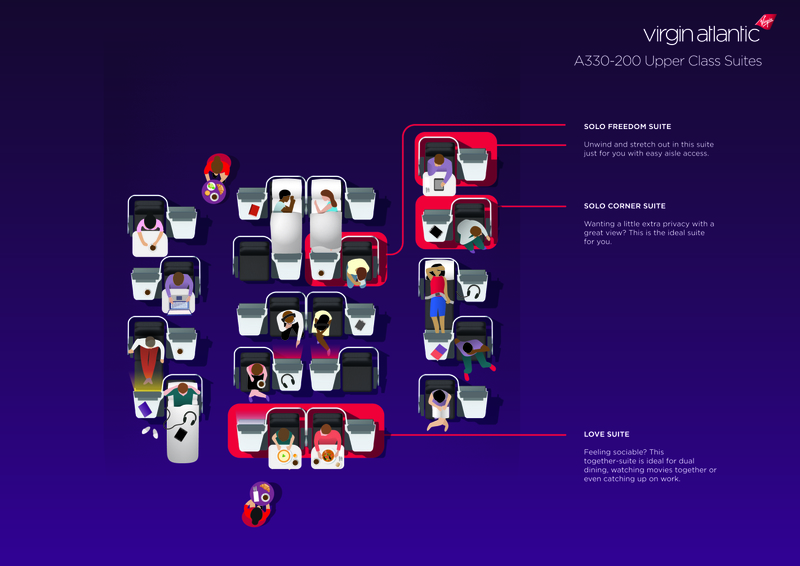 They are obviously planning on keeping them for quite a while as they have been investing in refurbishing the aircraft to bring it up to Virgin’s standards and branding plus add Premium Economy. Yesterday they unveiled the first finished aircraft results and I think it looks pretty impressive! I will try and squeeze in a review when I can. Unlike the usual Upper Class seats they are not the usual flip over design and are arranged in 1-2-1 with alternating layouts. 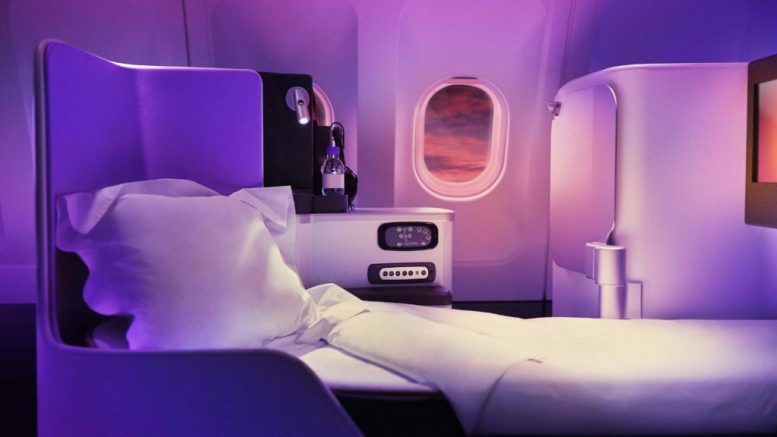 The ‘Love Suite’ is a little like BA’s middle Club seats which are unofficially called ‘honeymoon seats’. I would strongly recommend avoiding these as a solo traveller (or you are not that keen on your travelling companion!). As you can see from the photo below they are pretty close together with a small head height divider between them. The best choice for solo travelers will be the window seats, particularly the solo corner suite which is the most private. 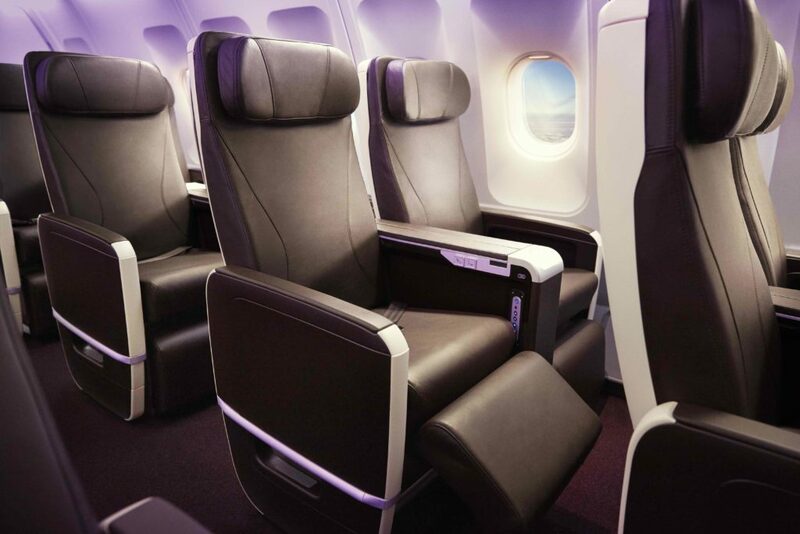 The Premium economy seats are the latest Virgin Atlantic seats. 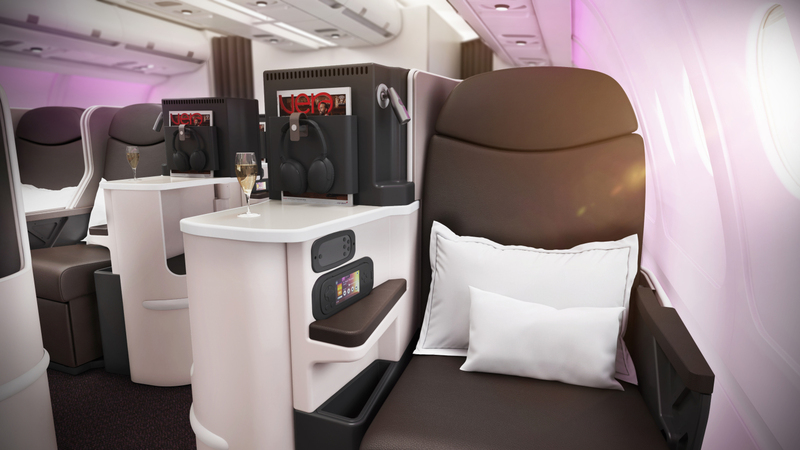 All trim and finishes, including the seat fabric with natural and soft Espresso leather, were selected by Virgin’s in house design team to keep the unique Virgin Atlantic flair. As per Virgin standards the aircraft offers high speed WiFi, power in every seat and entertainment with personal screens in all seats. The remaining three A330-200 refits are all expected to be completed by January 2019 and the aircraft will operate on Caribbean services from Gatwick Airport, along with a number of US flights from Manchester. 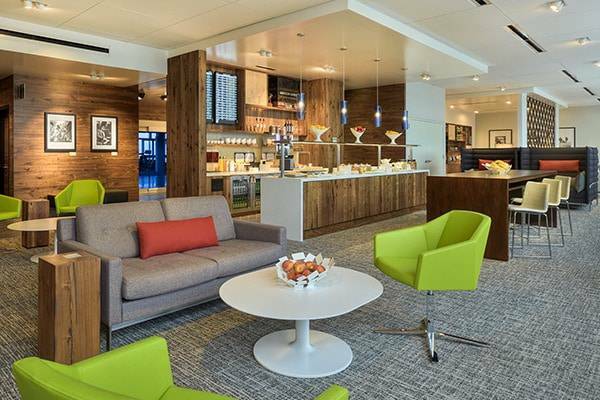 If you have an Amex Platinum card not only do you get a Priority Pass but you also get access to other lounges such as Plaza Premium and Amex’s own lounges, Centurion. Platinum Card members receive complimentary access with up to two guests at no additional charge. The lounges used to be mainly in the US but they have been expanding recently with a lounge in Hong Kong now too. Now as if there wasn’t enough lounge decisions to make in T3 (shame T5 isn’t the same), the lounge will situated there and will feature the usual food, wine and cocktails plus showers. The ones I have visited can get crowded but they do normally provided a high standard of food and drink compared with many lounges. On Wednesday Oneworld announced their newest member which came as no surprise since it was Royal Air Maroc. Personally for me it will not really be a great amount of use but if you fly around Africa and the Middle East it could be a useful Avios and Tier point earning partner. 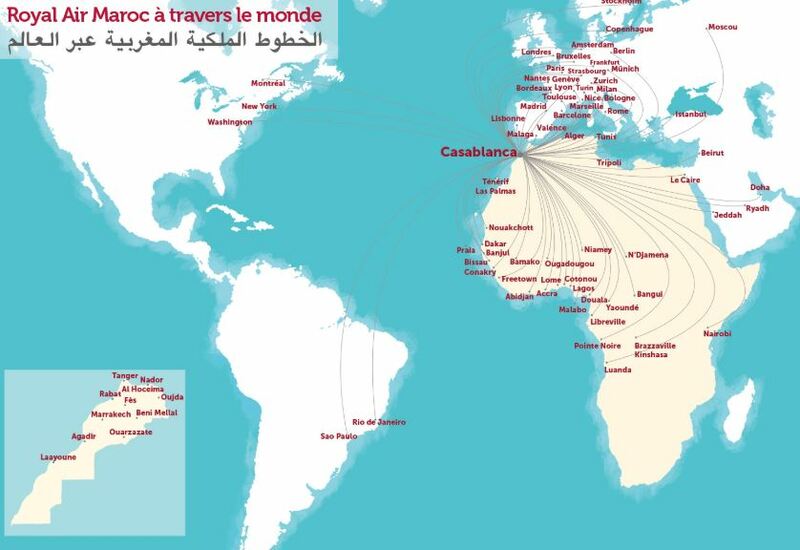 They also fly to Casablanca which BA no longer serve so that could be another potential use. They are not expected to join until mid 2020 which is something of a relief as I am contemplating trying to do all the OW airlines in my tier point year and 13 airlines is bad enough already! Tickets are selling fast for our first event in conjunction with Business Traveller Magazine on 31 January 2019 in London. Hopefully, this will be the first of many successful TLFL events and we plan to work with Business Traveller in the future for further events. The exclusive reader event at the end of January will be at Zuaya, the latest destination restaurant for modern Latin American fusion fare. Owned by young Spanish twins Alberto & Arian Zandi, Zuaya takes diners on a journey around Latin America – dynamic, authentic flavours from Peru, Mexico and Brazil, right through to the southern tip of Argentina. zuaya.co.uk. The event will be hosted by Business Traveller Editor Tom Otley and Turning Left for Less. TLFL’s Deputy Editor Paul will be available for expert advice on the night. 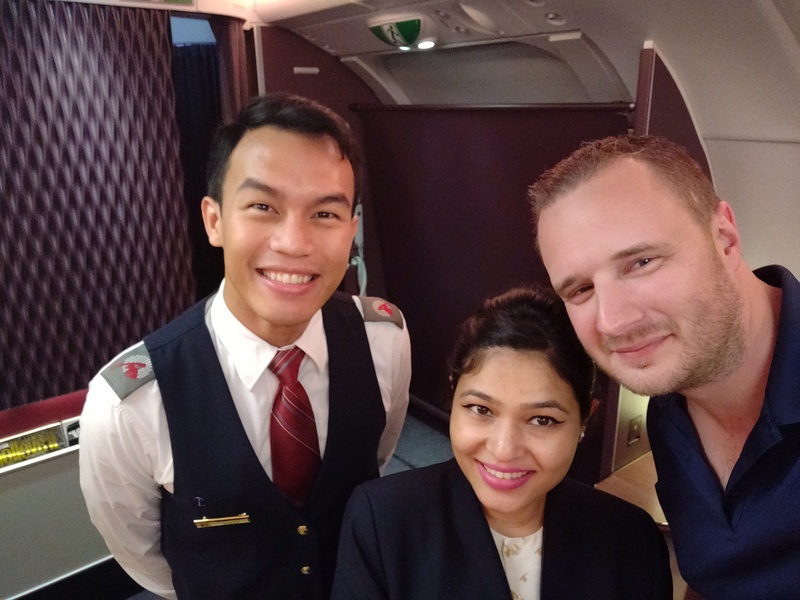 Paul is a frequent traveller with top tier status with airlines and hotels who knows how to make the most of them as well as being a tier point run specialist. Guests will be greeted with a welcome cocktail, before sitting down for a six-course culinary experience. You can find more information book tickets via Business Traveller here. 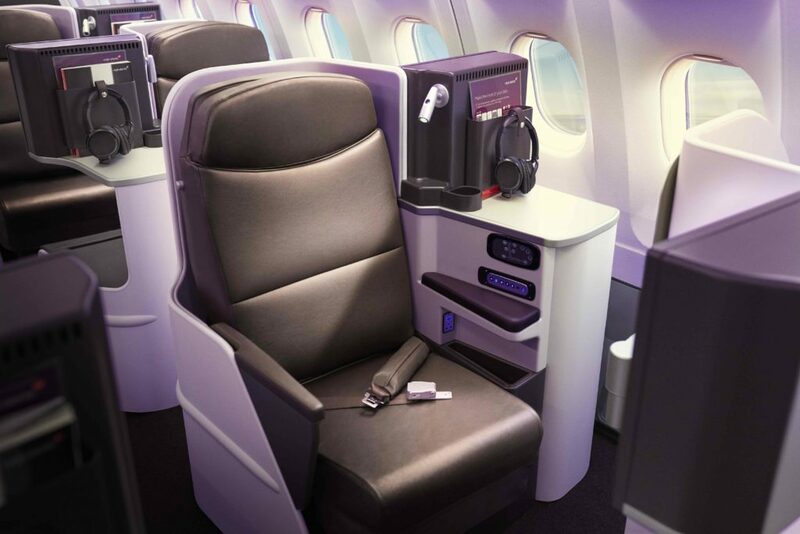 2 Comments on "News & offers: Virgin’s new seats revealed, new Amex lounge at T3 & new Oneworld airline"
I wonder whether the chair can recline as much as possible and not how it currently does where it part reclines and the goes into a bed. There is no midway point. I don’t really like the current chair setup. Although it doesn’t specifically say all these brand of seats recline fully into a bed so I would expect this to be the same. I am not a fan of flip over seats either though I do find the Virgin ones good for sleeping.